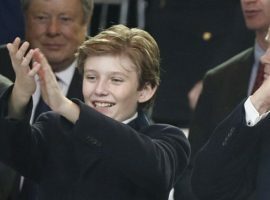 According to sources near to the Trump family, Barron Trump’s laughter has been heard every day echoing through the gilded halls of Trump Tower as he is entertained by puppet-governments. The ten-year-old multi-millionaire has shied away from most sports and games, but has found watching the spineless husks of politicians jump around to be endless delight. “It’s been a godsend. Instead of having to read him stories, or run around playing hide and seek, I just pop on C-SPAN or Fox News and he’ll be giggling gleefully in no time,” said Bill Marcellus, head of security and personal attendant to the youngest Trump. The baron Barron used to spend many a weekend putt-putting around on the family owned Trump International Mini-Golf Course. But now the silly escapades of government officials being broadcast through various news networks consumes much of young Trump’s attention and time. At press time, sources report that Barron Trump has become fascinated with creating great white pillow houses, stomping through them while shouting “Glory to the Kremlin!”, and raising a lightsaber-turned scepter in triumph.